Eating More Fruit and Veggies Never Tasted So Good! My 10 year reunion at Wilberforce University is coming up towards the end of February, so I am in the process of shedding an extra 20 pounds that I found in Detroit. I don’t know where I found this 20 pounds but I know one thing this 20 has to go. I am following the Fat Smash diet loosely and I am incorporating more raw veggies and fruit into my diet. In my efforts to eat more raw veggies and fruit I stumbled upon a great salad recipe. I was trying to recreate a salad that I had at the Atlanta Bread Co., but I came up with something all my own. I know when I first heard of fruit in a salad, I was totally turned off. That just comes from no exposure as a kid. My mother stuck to what she knew and nothing else. Now that I am eating new things my sister and other family members call me Country Club (another word for uppity or booshe (sp)). Or they say…Oh Trina is cooking those Country Club Meals again. They can call me what they like but I know that by eating more raw fruits and veggies will help me to get rid of the extra weight as well as help me feel better. The new fruit and veggie combinations have my taste buds doing the cabbage patch right now. I never knew that fruits and veggies could taste so good. Well, I am back from my dad’s wedding celebration. I had a good time seeing everyone after 10 months. My dad’s wedding was nice. 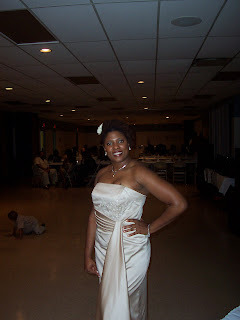 There were some things that happened that I personally would not have tolerated but hey it wasn’t my wedding. My dad hasn’t been married in over 30 years so there was no way he wasn’t getting married in a church. 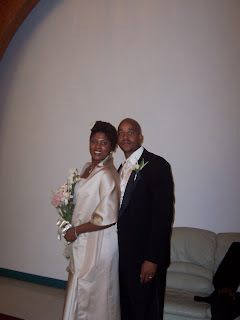 His wife was married two times previously but it wasn’t in the church so this was her first wedding. There were a lot of things that she didn’t know and relied on her family for, but certain family members used that as their time to shine instead of saying hey I don’t know how to do this or researching how to do it. For example there were two coordinators. Yes 2!! Well actually 3 because the niece’s mother decided to join in. The reason for that is the niece is a Jehovah’s Witness and her religion prevented her from entering the sanctuary of other churches. So the seamstress/makeup artist/ cousin acted as the coordinator. Okay in my opinion if my religion prevented me from doing the entire job I am going to bow out completely and just help out where I can. I would just allow someone else to be the coordinator. Nope! That is not what happened. With two coordinators that lead to a lot of confusion which included no DJ because no one called to confirm with the DJ, a mad stampede to the buffet line, the wedding ceremony started 30 minutes late and the reception started over 1 hour late. This is a great example of too much of a good thing can be bad for you. So three wedding coordinators = less work accomplished. I had an opportunity to spend time with my nephews. 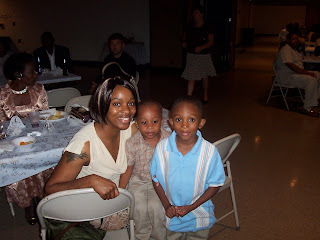 I love my nephews and my sister so much. I noticed some things while there that I understand are not my sister’s fault because here is only so much she can do as a single parent. That thing is my nephews are craving male attention. The children’s fathers are not present in their lives and it is such a shame. 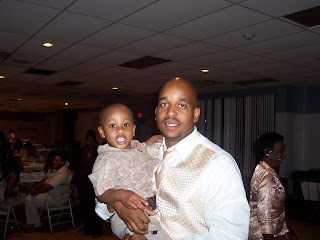 My youngest nephew Javon aka Peanut was all over my husband. “Uncle Charles” “Uncle Charles” was all that came out of his mouth. While Peanut loves Uncle Charles he has the utmost respect for him. If Peanut acted out all I had to say was “I am telling Uncle Charles! !” and he would cringe and say “NOOOOO!” Peanut requires a lot of attention so I can see how my little sister can spend so much time and sort of neglect Jalen. While I was there I tried to spend as much time with Jalen (the oldest nephew). Even if it was just a dance with just he and I during my father’s wedding that is what I did. When I lived in Detroit I would come and pick just Jalen up and take him to a basketball game to let him know that he was special too. He is missing his father as well! He is an Auntie baby though. He flocks to me and remembers everything we do together. I just don’t understand how a man can walk away from their children…their own flesh and blood and leave them wanting. Shame on them! During the time home we ate so much great food I feel like blah. Plus I haven’t been in the gym in like 2 weeks. Bad Trina! I know!! I would say I gained like 2 pounds from my trip home. My dad’s friends all know how to cook and were throwing down whether it was on the grill, on the fryer, or just period in the kitchen. They made sure I ate too. Come on girl eat up!…You know you want some more! So you all know what that means. I am officially back on the Fat Smash and my workout plan. I want to begin using my home equipment more so I am going to make an effort to get up on the weekends to do my running and workouts. I lost 10 pounds on the Fat Smash diet last month and plus my monthly symptoms were non existence so if for nothing else but to alleviated cramps and bloating I am back on the wagon. 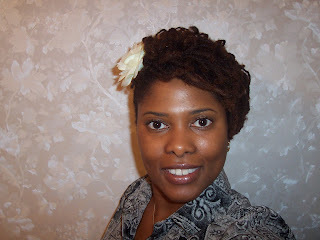 Well I received so many compliments on my hair that I thought I would post my style and the products that I used to obtain the style. 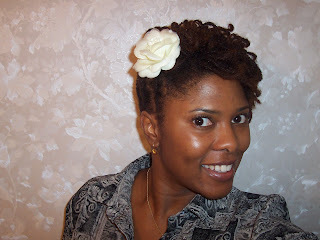 This style I like to call my curly MOHAWK. Get it girl! I love this style because it was so easy to achieve. First I washed and conditioned my hair with whatever I had at the time. I am a Product and Makeup Junkie. I admit it! The first step to recovery is admitting...I know. Okay I digress. Next I took some Juanita DesignCream by Naani...www.naani.com/store. I am not sure if Naani is still making this or not because I just went to the site and all of their Juanita series is on sale. So that means that if you hurry now you can get conditioner, shampoo and other things in that series on a serious sale. 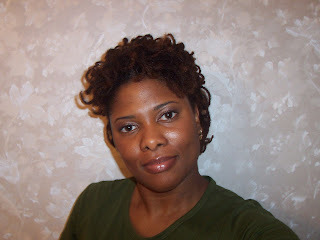 Moving on...I then used white and gray perm rods to roll my hair. No end papers just the rollers and my hair. I sat under my bonnet blow dryer for maybe 2 to 3 hours. My hair holds water like no one's business so I have to make sure my hair is dry before removing my rollers to get those curls. Once my hair is dry I remove the rollers and put my satin bonnet on to go to sleep because that time it is my bed time. In the morning I run my fingers through my hair and put to clips on each side of my head to achieve that mohawk. One curl falls in my face like Prince or Michael Jackson and there you have it the Curly Mohawk. Wow here is my very first post on Blogger! I had the opportunity to get out and mingle this weekend. My husband and I have been living in the metro Atlanta area for 9 months now and we are finally getting out and enjoying some of the venues. Friday night we went to a FREE Jazz concert in Suwanne (sp) park. REALLY NICE!!! Did I say it was Free! We brought our lawn chairs and kicked back and relaxed. There were a lot of kids there so it is a wonderful family event. 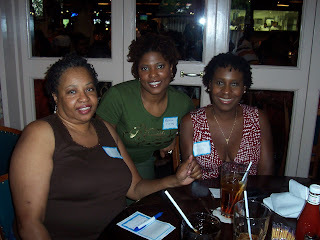 On Saturday I attended a Sisterlock Gathering for women in the Atlanta metro area at Pappadeaux. Good food, great networking, and great personalities. I learned so much during the 4 hours we dined together. I am also so very proud of myself for doing my own hair and receiving so many compliments. All the ladies were so interested in how I obtained my curly mohawk. 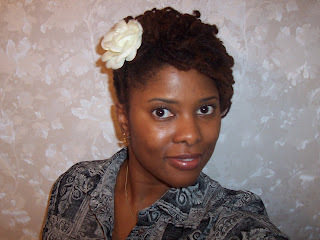 They wanted to know the styling cream, the style rods, and what how I covered my hair. I am so proud. I even retighten my own hair which was a shock to them. It really feels incredible to be in a city where black women are supportive and friendly. My experiences while living in Detroit were not so pleasant and through those experiences I truly feel as if I lost a part of myself that I am slowing regaining here in the South. That part of me that I lost was my outgoing personality. Don't get me wrong I am still outgoing but I am more reserved. I watch people to determine what their intentions are. I don't mean to be that way but I have been hurt so many times in Detroit by women who pretended to be my friend but showed out in the end. Great thing is the south is bringing me back. Thanks ATL! Sunday, was a beautiful re-birth for me. I was baptized yesterday morning and I am so happy I did it. I feel like a ton of bricks has been released from my shoulders. WHEW!! I sat yesterday and just felt like everything that I did in my past doesn't even exist anymore. It is really hard even to remember. It is not even important to me any longer. God is good! !